As a radiologic technology student you will learn how to work closely with patients and how to take conventional clinical X-ray images. You will be educated in anatomy, patient positioning, examination techniques, equipment protocols and radiation safety and more. After graduating you may specialize in a specific imaging technique such as bone densitometry, cardiovascular-interventional radiography, computed tomography, mammography, magnetic resonance imaging and quality management. The St. 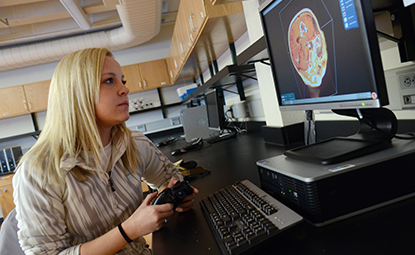 Cloud State radiologic technology program does not include any training in sonography (ultrasound imaging). Rigorous course work in biology, chemistry, mathematics and physics. Clinical phase involves a high degree of patient contact. Graduates earn a bachelor's degree and qualify to take the radiography board exam. One of the few four-year, face-to-face Radiologic Technology bachelor of science programs in the United States. Students have the opportunity to do their clinical phase with one of eight clinical affiliates.